We got some good submissions for the Least Necessary Sports Column "contest," so while you're waiting around for various balls to drop here's some light reading that will make you say, "Why did this happen?" There's still time to submit more to #thatsunnecessary, but again we're looking for pointless, not just stupid. For example, an article about Steve Spurrier offering to golf with Urban Meyer is certainly dumb, but at least there was a (very tenuous) news hook. Same goes for all end of year/decade lists, no matter how ridiculous. Also, this story about the U.S. Transplant Games (for athletes who have received organ donations) is definitely a holiday time news hole special, but at least it has a nice message. Be an organ donor, people! Headline: "At the Farmer house, every day is Christmas"
Synopsis: A story about former major league pitcher Ed Farmer who also received an organ transplant. In 1991. Headline: "Glove, baby news top Zach Miner's list of holiday memories"
Synopsis: A Detroit Tiger pitcher discusses his favorite Christmas traditions. Headline: "What the Chiefs could feel while playing at elevation"
Synopsis: A scientific explanation of what happens to football players when they play a game one mile above sea level. Headline: "They're gamers, in more ways than one"
Synopsis: An in-depth examination of minor league hockey players who also enjoy playing hockey video games. Headline: "Union lawyer Rob Ades is a true college basketball fan, case closed"
Synopsis: John Feinstein introduces you to a bizarre man who practices law and, in a shocking twist, and is also a big basketball fan. Synopsis: Rick Reilly® writes a poem about Drew Brees. 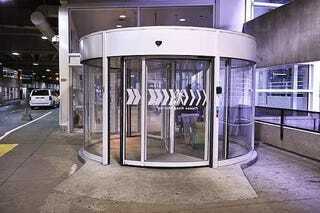 Headline: "Revolving door a major sticking point at airport"
Synopsis: The winner for Least Necessary Story, Non-Sports Division is an investigation into a broken door at Detroit Metro airport. Headline: "Seizin' upon the opportunity"
Synopsis: Writer Phil Arvia composes a series of random, unrelated thoughts that is also an acrostic spelling out, "Happy Holidays." Stunning ... and stunningly unnecessary.